…I get very excited. RabidMonkey, I salute you. However, this single screenshot is much more than that, and level designers should take note of how it has evolved from the original version. Granted, it’s clearly still in development, and this is only a single shot, but it’s worth examining some of the cool features. My personal highlight of the shot are the long shadows on the facing side of the dam, which just look exceedingly cool. However, the four posts at the top strike me as a particularly interesting (if apparently minor) technique to disrupt views from one end of the dam to the other. 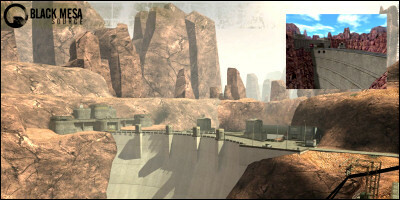 If it were a CS map, those posts would play a very important role for across-dam battles.